The 'consulting detective', Sherlock Holmes, has been called to an American town to solve a strange mystery. Only... this time the pen pulling the strings of the World's Greatest Detective is held by literary legend Mark Twain. In a style that could only be presented by Mark Twain, this tale begins "with a situation that suggests endless possibilities..." But "Mark Twain intended from the first to have some fun...as well as to surprise his readers. Therefore the second part of this short tale develops unexpectedly into a most ingenious parody upon Sherlock Holmes, capitally done." - The Book Buyer, Volume XXIV, 1902. 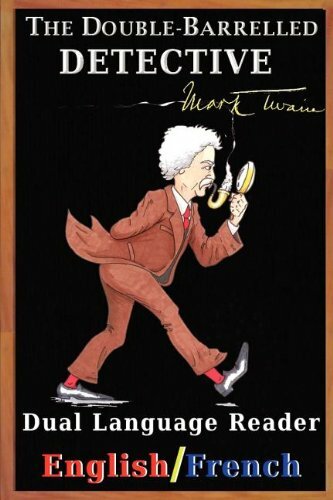 This compilation features the famous parody of Sherlock Holmes, "The Double Barreled Detective" by Mark Twain coupled with François De Gail's masterful French translation. As opposed to memorizing French phrases or forcing yourself to get through another dry French grammar or verb manual, this Dual Language Reader ("DLR") keeps you eager and excited to turn each page! Short stories in DLR format serve as an excellent tool to aid you in developing the ability to "think" in French. Language Formatting (English & French): French: Translation by François De Gail English: The story's language of origin. Using this Dual Language Reader: The key to mastering any foreign language is developing the ability to "Think" in that language. With the English text on the left (even pages) and the French translation on the right (odd pages), you're able to comprehend, precisely, the ideas being conveyed without turning a page! For those students who wish to test their ability to read the French text, simply fold the left page back to easily hold & read each page (or the entire book) in French; if you have difficulty understanding exactly what the French text is trying to convey, you can quickly look at the English text to help make the concepts clear and get yourself back on track. Another useful technique (for beginners, especially) is to read the English translation first and then, once the concepts are clear, move on to reading and comprehending the French text. Your goal, other than enjoying the process of learning, is (again): to develop the ability to "think" in the new language. A Dual Language Reader is an excellent tool for helping you to do exactly that! If you have any questions about this product by Study Pubs LLC, contact us by completing and submitting the form below. If you are looking for a specif part number, please include it with your message.